Aji Frai ('アジフライ', is classified into deep-fried dish), is known as Deep-fried Horse Mackerel in English, and 炸竹荚鱼排 (Zhà zhújiáyú pái) in Chinese. It is the washoku. 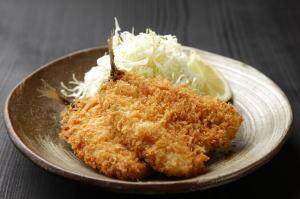 Horse Mackerel Cutlet, Aji Fish Fry, Fried Horse Mackerel. Horse Mackerel, Egg, Wheat Flour, Oil, Breadcrumbs, Salt.